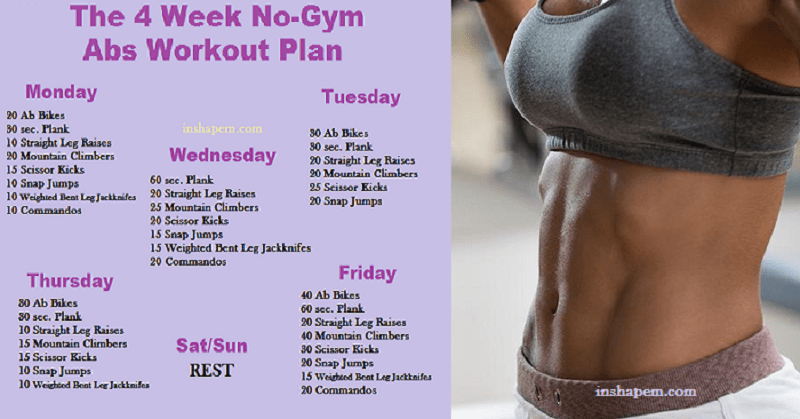 The 4 Week No-Gym Abs Workout Plan. No Crunches! In this program, we will focus on the abdominal area which is also the hardest area to burn fat and get into shape. In today’s article, we present to you a workout program that is extremely effective exercises. Moreover, to perform these exercises you don’t have to go to the gym or pay some expensive programs in order to see results. By following this program you will burn fat and tone your abs in the fastest period of time possible. What you should have in mind is to avoid any junk foods, sodas or sweets as they are the biggest enemy of the perfect abs. Drink plenty of water and make sure you are consistent in practicing the exercises. As in many other workouts results may vary, but be sure you follow the required exercise guide for the best results.